Welcome to Allen's Sensory Overload Challenge. Like Allen, it's simple (sorry, couldn't resist...). Like Chris, it's beautiful (and again...). Anyone can submit. All entries are published. Discover how delightful writing purple prose overloaded with sensory description can be. Allen and Chris respectfully suggest: No more stories about eructation, breaking wind, being caught smoking or waking up in a coffin. These have now been adequately covered. Thanks. So far, we've received 222 stories. We need 78 more to publish the anthology. Sight/Seeing, Sound/Hearing, Touch/Feeling, Smell and Taste. Or at least have had a go! Assail us with your aromatic, smooth, salty, bell-ringing purple prose. You know you can and you know you want to. Many 'How To' books will tell you to be precise and careful when using sensory words. We want you to be profuse and bountiful. The more the merrier. Chuck us into the setting and the situation. Overload us with sensory input and information. And tell a bit of a story as well. It's not too much to ask, is it? 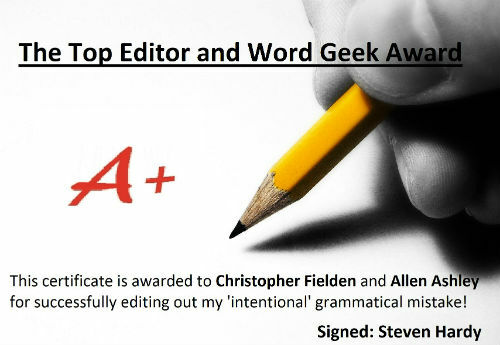 We're sharing this here in the hope that it inspires more authors to award us with stuff. As yet, we've had no takers. This situation needs resolving, ASAP please. Proceeds from sales of the sensory writing challenge anthologies will be donated to the National Literacy Trust. This charity is committed to helping raise literacy levels in the UK. The writing challenges run on this website do the same thing, in a roundabout kind of way, so this seemed like an appropriate charity for us to support. Having seen the photo at the top of the page, this will be immensely hard to believe... Allen and I have not yet shared photographic space together. I know, I know... please try and contain your shock. While we were chatting, we decided that running a writing challenge together seemed like a good idea. 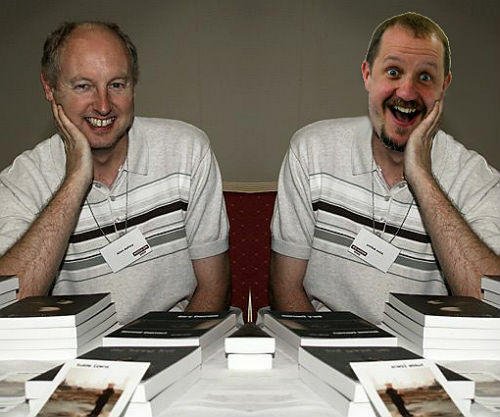 Allen has been a great supporter of the writing challenges run on this site. Not only has he submitted his own stories, he's shared the challenges with the various writing groups he runs/belongs to and has generated lots of submissions from many authors. So, it's great to be able to work with him on this challenge. Each time a story is received it'll be published below. Every time we receive 100 stories, they will be published as a collection. The books will be made available in print and Kindle eBook formats. Proceeds from sales will go to the National Literacy Trust. 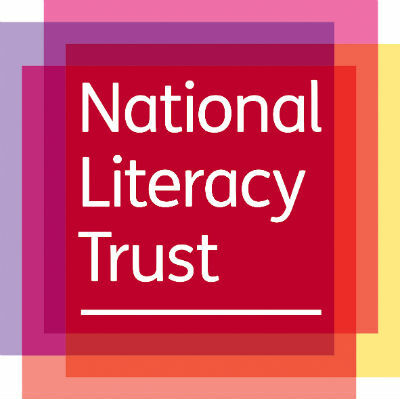 If we don't receive enough submissions for the next book, it's a bit of fun, you can read all the stories here on the site and you now know the National Literacy Trust exists and that they do fabulous work. As with all the writing challenges on this site, it's impossible to lose. Everyone wins. Below are all the sensorially saturated stories that have been submitted to date, drenched in purple prose. See the words. Hear the joy. Taste the magic. Smell the stories. Touch your toes. We received the 100th sensory story on 10th August 2017. The first 100 stories were removed from the website on 1st October 2017. Sensorially Challenged Volume 1 was released on 2nd December 2017. You can learn how to buy the book and support charity here. The book contains flash fiction stories written by 100 authors. Profits from sales will be donated to the National Literacy Trust. You can see how much money has been raised for charity by all the challenges run on this website on the main Writing Challenges page. We received our 200th sensory story on 31st January 2019. Stories 101 to 200 were removed from the website on 26th February 2019. Sensorially Challenged Volume 2 is now in production and due for publication towards the end of June 2019. We are currently accepting stories for Volume 3. 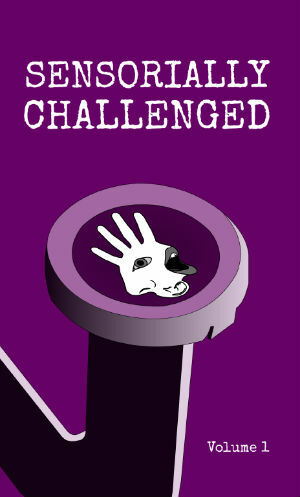 You can read the submissions received for Sensorially Challenged Volume 3 below. Martin likes being inside his tank of smart liquid; but I hate the confinement. "What sort of life is this?" I moan. "I feel really out of touch." "For the hundredth time, Simon, the whole point of sensory deprivation is to free the mind to think, to wander, to transcend." "But all it's doing is making me miss a whole gamut. The smell of Janine's perfume; the salty taste of crisp bacon; the uplifting strings of a Mozart symphony; the touch of silk or cashmere against—"
"Yeah, I know, pal. And watching the sunset. Give it a rest, right? They're all gone." It's true. I don't have a mouth or ears anymore. All this talking is happening telepathically. I can't see Martin, either. But I know he's there: another bodiless brain preserved in a glass jar. Moving through the dawn-cold kitchen with half-sleep muscle memory, she found the tea caddy. The kettle was placed over the orange flame and the heating water began knocking against its metal sides. Her hand dipped into the tin and her fingers found the papery cocoon of the tea bag. It felt warm, dry and almost like skin, encouraging her thumb to move back and forth across its surface. Absentmindedly, she brushed it against her lower lip. She inhaled the smell of Christmas and Indian chai tea. First the warm smell cinnamon, then the sharp, antiseptic, nostril numbing clove. The kitchen window sweated with steam. She watched the larger drops combining, producing little tear rivers running down the glass. The kettle began to demand attention. She went to it before the whistle squealed its top note. The hot water hit the teabag, which started to bleed sepia into the filling cup. There was a pause, the chinkle, chickle of the spoon. Then the first sip and sigh of the day. Bass and treble buzz around me in a hipster cafe as I order a black, pungent filter coffee from a nose-pierced, tatted blonde, who looks more like a punk singer than an overworked barista. I stand to the side of the sleek, wooden high-top bar and eavesdrop on a hushed conversation from two energetic girls sitting nearby. One of them, toned with deep wrinkles and a pale face, chats with a heavier-set friend in a language I barely understand. "This and that," I presume she says, "with the guys and girls," she continues, "we went there and did that," she finishes. Her friend with rosy red cheeks and dark, bushy eyebrows laughs and snorts between lusty bites of a Danish apple pastry that makes me sort-of chuckle. I receive the piping hot cardboard cup and find a seat by a frosted window in hopes of catching some warm sun before it sets behind the white winter mountains. I sip the earthy, aromatic java as my bottom numbs and my heart races. I'm sweating, captivated by the frenzy of a beat so powerful it sounds like a living, breathing monster. The rhythm section motor behind me, smoke clouds the air and the stage lights burn. The atmosphere is vibrant, the crowd hungry. Ian Maiden's bass rumbles with wrath. Jack Sabbath unleashes a demonic riff. Beneath my feet, I feel the stage throb with the thrum of music. A mass of bodies bounce before me in unison. Dwight Snake points back at me and shouts, "You wanna hear some guitar?" I face my wall of Marshalls and allow the hum of feedback to grow. The volume becomes painful before I turn to face the audience, unleashing a solo that feels as though it's oozing from my fingertips rather than me having to play it. As I hold the final note and push down hard on my Les Paul’s whammy bar, Dwight starts hollering lyrics. "Why would I agree to that?" The earlier argument with Roger shot round Laura's head, as she collected her rubbish bin from the street. The very idea of making someone 'disappear'. No trace. Cover my tracks. All for love and £250,000 insurance. A blue sports car briskly parked. Nervously, Laura looked. It was Roger. Stepping out he hissed, "Well?" in greeting. "Are you in? Be a decoy. Easy." Clang. Laura dropped the dustbin. The plan was terrifying, yet thrilling. Roger was persuasive. She loved him. Her husband, Paul, was boring. A selfish, rich bully. He knew nothing of Laura's affair. She was rough, pushing past Roger, to pick up the bin. "Sweet," said Roger, striding to his car. "I knew you'd agree." Paul appeared, walking on crutches from an unexplained mishap. Near the primroses at their gate, Laura took his arm, curiously saying, "I'll help you cross the road." With Paul in view, Roger accelerated hard from his parking spot. He didn’t see the truck pull out 'til too late. The warmth caresses my nakedness, liquid heat seeps through my body, extending to every extremity. Relaxed, I stretch cat-like and sigh with pleasure. Seagulls caw in quadraphonic harmony and the shhhh, shhhh, shhhh of the lapping waves on the sea shore act like a lullaby. Is that the scent of rotting seaweed invading my nostrils? Maybe. My eyes are closed in bliss and I can almost taste the salt of the ocean. A hand creeps from my towel. I want to feel the sand oozing between my fingers. Eyes still shut, I touch – empty space? I'm thrown back into reality. Crawling out from under the sun bed, I look out at the pouring rain, turn off the ocean sounds mood music and prepare to leave for work. Amanda, darling. Your email spread a warm joy upon seeing it – such a delight to hear from you. Exciting news. I have a whiff of a new play in the West End. Auditions on the 16th. Yes I know, dear, me doing auditions when just a glance at my CV sends one into raptures, but it's the producer. Archie Armstrong no less. Yes, him of the flowery prose and nose. But needs must, sweetie, and how marvellous it is to be at the Argon Theatre. I faint every time I see it, with its delicious aroma and divine acoustics. In my heart, I know I shall take a part. Do come to opening night. I long to set eyes on you again and drown once more in your dulcet tones. Love, kisses and caresses. Randy. He looks up when the tangy aroma of vinegar reaches his nostrils, making his mouth water, and he can almost taste those fried potatoes. People mill around in front of him, but he picks out the person with the bag of chips and stares longingly. A group of school children come down the stairs, their blue and red uniforms looking bright in the late afternoon sunlight. There is the chatter of people standing around him. While some talk into mobile phones, overhead there are train announcements being made. This hustle and bustle doesn't bother him, because he does this journey nearly every day. Then he hears it. The train approaches, its steel wheels screeching noisily as it pulls into the platform. Just then, he feels the harness handle being lifted from his back and the hand ruffles his fur as once more he is standing ready to guide his master onto the train, the train which will take them home where a well-earned dinner awaits. Ben couldn't believe his eyes. 'Bacon Causes Cancer' screamed the headline on his laptop. He laughed and turned to the pan of lamb broth on the hob. "More salt," he decided, taking a slurp. "Ow, that's hot." Ben loved cooking, particularly when alone, listening to classical music. It would finish before Shirley got home. Not a fan of Beethoven, our Shirl. She'd come in, a wall of sound, complaining about her supervisor, Megs, or Dregs, as Ben called her. He let her in. Sheila breezed through. "Mmm, something smells nice and sounds awful," she chimed, instinctively picking up a spoon. "No," Ben admonished. "Too many cooks and all that. Bacon sandwich, Sheila?" She shook her head. "Where's Shirley?" Almost on cue Shirley walked in. "Hello, love," she said, "Oh, hi Mum, I've had a brilliant day. Meg's off." The rest of the conversation melded into the backround as Ben tested the broth. Off? Not off at all. Megs Lamb was still very fresh. "And a bottle of coke with a straw and some salt and vinegar crisps." Yes, music to my ears, but the pong of beer and fags attacks my nose. So I'm off, like Batman to the Batslide. I gawp mesmerised by its shiny, silvery... slideyness? Clamber those splintery steps, reach the two metre peak and touch the sun. I hear the fizz from the bottle whilst my mouth chases the straw. Sluuurrrpp. More energy required. Crisps. Oh my god, they're like radioactive bits of crunch. My eyes water and my cheeks collapse. Now it's time to WHEEEEE. Again and again. I am a giggle machine. I shimmy down once more, ignoring the hot summer heat, metal burning my legs. My plimsolls squeak on metal. Racing around the grass with that 'just cut' aroma. "Eurghhh. " That's not grass. I clasp my nose, staring at the black and brown foot. The slide whispers, "One more go." The train suddenly lurched and, with a screech, came to a halt. June wiped her hand along the cold window, making a small spy hole through which she caught sight of a blue van rolling over and over in the adjacent field. Alarms on the train started to ring and, with a loud clang, the driver's door flew open. The uniformed man leapt out of his cab into the rough grass and raced towards the van. As he approached, a figure crawled out of the wrecked vehicle and slowly got to his feet. "Are you OK?" shouted the train driver. "Yes, I'm fine," came an unsteady reply, "but my van isn't." A faint, sweet aroma wafted in the air as the dishevelled man rubbed his head and looked down at the tangled heap of metal that was his van. "And I think that's the end of Primrose Pies too." Sam turned to Jackie exclaiming, "Don't look at me like that. Not with those blue eyes. P-please." "Why, they're the only ones I've got," she laughed. "I'm done for then. I can't say no." Jackie grinned. "Off to meet Mum and Dad we go then." Ten minutes later and Jackie rapped on the door knocker, making a large clang. "Come in, my dears, come in." Wiping their feet on the rough mat, in they went. Soon they were in the living room and being introduced to Jackie's dad, Tom Burns. "Would you like some of my sweets?" he enthused. "Absolutely delicious. Try some." Jackie's mum, Heather, followed them in. "Cup of tea, anyone?" "No thanks, Mum. Mum, Dad. Please sit down. We've got something important to tell you." It was suddenly very hot in the room. Jackie opened a window, ushering in cool, fresh air with a scent of primrose from the garden. "We're engaged," she blurted out. "This is my fiance, Samantha Daniels." Today, I began my calls to the homes on your list. I made only one visit and should probably have left when I reached the front garden. A mess of split bin bags and indecent-looking ooze belaboured my eyes. A second later, an odour from what I imagine might come from a pit of plague victims assaulted my nose. Acidic bile rose in my throat and coursed across my tongue like demonic mouthwash. I persevered, though. A shiny door knocker lay ahead. I grasped the knocker and, too late, realised that it was thick with metal polish. Stinging gobbets of the stuff clung to my fingers. I was trying to clean my fingers on the roughcast wall of the house when the door opened. A smiling, elderly lady greeted me. For a moment, her presence calmed my distraught senses. Then, behind her, an enormous dog barked thunderously, ripping the fabric of my eardrums. I hastily retreated. I must therefore tender my resignation. I believe that I'm too sensitive to be a bailiff. The index finger of my left hand traces the outline of the first hieroglyph: an impassable mountain between two fathomless valleys. The next, a blazing black sun hovering serenely over a lamppost. The third and fourth symbols are identical: twin hillocks in an autumn meadow. The fifth, a slippery, squashed spiral. But with the sixth, I turn a corner. I trace them again. The contours click-clack into familiar form. There was only ever going to be one. Bright blue-eyed Corporal Laika braced herself too late. The jolt of the fiery blast ripped hard through the personnel carrier, sending so much twisted pain into her guts that she decided it best to drop out of this overly glorious line of soldierly work. Her sixth sense and training kicked in, comforting her so at least she would not taste the bile and choking fear. She tumbled freely around in the salty stench of fresh guts and hot metal. Her mind recoiled and her ears rung. "To hell with them – drive on," Sargent screamed. Events played out in grimy, bright detail. And yes, there was nothing she could do. The government-issued green band of her watch snapped, spinning like a touching ballerina through space. Watching it felt like five godless eternities. A bright idea flashed: Jump from the APC. She never felt the second impact. Corporal Laika’s blue eyes were sightlessly open as the busted engine began to hiss. Perched on a stool, amid garden tools and cultivating seeds, I realise ventilated footwear wasn't a shrewd move. Boulder-like raindrops pummelled my hair, now hanging limp. Magazines and lottery tickets merge in my shopper, producing a kaleidoscope of colours. Glancing towards home, felines watch me watching them and I detect smugness. I alleviate boredom by calling my son but don't reveal my predicament. Goodbye reminds me little time has elapsed. The stool shakes as my body objects to saturated clothing adhered to it. Tissues disintegrated, I consider using my sleeve to wipe my nose but realise the futility and resist. Battering rain intensifies my feeling of misery until I remember my phone is brimming with soothing music. Later, my partner slid the greenhouse door open and asked, "What're you doing in here?" My scornful look elicited a response of, "Forget your keys?" The absurdity forced me to ignore him and squelch my way indoors. My body tingled as the warmth enveloped me and I chastised myself for being absentminded again. The pungent, briny aroma assaulted her with each short, sharp breath. Fear pulsated through her small body, propelling her into the fetid, tropical swamp. The tepid afternoon breeze barely cooled her sweating arms, as disturbed mosquitos swarmed their first prey. Staggering barefoot through the scorching soft sand toward the dilapidated waterfront fishing hut was torture. Sand-flies crawled unabated on exposed sections of leg. Perspiration slid down her back causing the dirty cotton shirt to stick uncomfortably. Terror fuelled body odour added to the malodorous aroma permeating the raised winding pathway. Slitherings and slidings, rustlings, creaks and croaks, the ominous sounds sharpening her awareness that things she would prefer not to encounter resided less than a meter away in the dense scrub. Her parched mouth and dry cracked lips begged for water, but still she ran. The flashing red and blue lights blinded her as she burst into the small clearing, straight into the arms of the surprised yellow-clad volunteer. Relief flooded his senses as he lifted the exhausted child into the ambulance. It's still dark and only 33 degrees outside. Large slushy rain drops darken the street lights. They beat hard on the windows, each ending with a slushy splat. I harness the dog and go out into the cold winter morning. An icy wind stings my face. After a couple moments I can barely move the muscles of my mouth and nose which is dripping onto my upper lip. It tastes of cold and salt. The rain finds its way onto the back of my neck. Wet gloves steal the feeling from my fingers and replace it with a cold, stinging sensation. My shoes and socks are getting wet and cold from stepping in puddles of slush. I can't feel my toes. Still we trudge on, hunched forward against the wind. I took my glasses off in calculation, before tucking them into the inside lining of my blazer, the newspaper exiting at force before my feet bounced off the surface of the platform in acceleration. It was all or nothing now. Bashing against businessmen's briefcases, I dodged past the customers at the Greggs kiosk in a timely, cautious manoeuvre, the burning of sausage rolls wafting through the station. Breathing heavily, the announcer's whiffy breath exhaled onto the whistle, bubble-gum popping against the loud speaker in a piercing yet tense intrusion, his lips lingering as he looked towards the last carriage. Then he blew. That was it, no more time. The doors started moving; five high-pitched beeps screeched in quick succession as they attempted to re-unite. Heads shifted towards me as I leaped over the yellow line. Reaching out promisingly, my fingers attempted to wedge in-between the ever-narrowing gap. Then the noise stopped. A spilt second. I pushed with all my weight. I stepped in anxiously and the wet earth seeped in between my toes like a birthday cake in a greedy child's hands. The scent of mud rose through the air, cut through by a refreshing smell of cold water. "Just a little more," shouted my aunt above the noise of the stream. "Over here are plenty of them." A shudder zipped up my spine as my feet reached the rushing waters, the swept-up mud tickling away at my soles. I hurled the line and observed it fall into a sparkling patch of water, narrowly avoiding a small nearby whirlpool, which they would avoid. Soon enough, I felt a tug, and I pulled on my trembling fishing rod. A shot of silver streamed through the air like a comet in reverse, and it fell on the grassy banks. I hurriedly waded to the shore, where my prey gave itself away by flipping on the green. The fish twitched in my hand as I removed the hook. Salty fried minnows for dinner. Delicious. "Why did I agree to that?" Pete whines like a child. I look at him as it hits me like a sledge hammer. I no longer love him. Immediately, I feel a huge weight has lifted from my heart at this revelation. My body shudders as the tension I've been holding on to for so long is released. I take a deep breath of tangy sea air and lick the salt off my lips, feeling the Earth's energy surging up through me like it had once before. I look out into the azure sky, over the white waves crashing onto the silver beach and know there's a huge smile on my face. I turn to him and say, "I really don't care what you do any more, Pete. I'm leaving." His mouth drops open in surprise as I normally give in to him, but not any more. I walk past him towards my primrose yellow car, to the freedom I have given up for far too long. My mouth opens and fills with saliva as my sunken eyes scan the shiny laminate menu that is fastened to crumbling plasterboard behind Nora, the proprietor. "There are other customers besides you, Bill," she spits, her green eyes looking me up and down suspiciously. "Didn't think you were the sporty type," she adds smugly. My enormous frame moves around, like a half-deflated beach ball, within the white plastic chair. I pick at a bit of dried tomato sauce that is attached to the table and breathe in deeply. I smell the bacon and imagine chewing the caramelised fat. Golden butter sparkles in the fluorescent lighting, sinking further into white sliced bread. Two identical sausages glisten and glide effortlessly as I push them away with my fork. My bouncing belly longs for the food, growling like a child, telling me it doesn't like quinoa. I draw a stick man in the condensation of the dripping window. While lifting myself up, I groan, thinking of the treadmill, and plod out the door. It's my first writing experience on here. I'm completely green about how to do it on a computer, as I usually write by hand. How do I do it as I would live to have ago at this? Thanks. OK, will do. Many thanks. Sounds like fun! One of my writing student just sent me this link. I'll see if I can get them to enter. I'll give it a go too. Hello Chris. Good to see the beginning of another fine challenge. Might have an idea of my own soon. Congratulations for introducing the Sensory Writing Challenge. Enjoyed all the interesting stories published so far. Good morning, Chris. It was good to read about your musical success in the USA. I'm really enjoying reading the other entries up to date. It's wonderful to have an opportunity for deep purple prose. Extremely happy for the well-deserved growth and popularity of your website. Rock on. It matters. Wilson. I put my finger on it and suggest this is not a challenge to be sniffed at. I spotted it on your site before I heard about it. It is very much to my and. it seems, many others sensitive taste. Hi Allen and Christopher. Thank you very much for allowing me to send my writing to this project. It's not only a great opportunity to publish my story, it's a great inspiration and fulfilling to work for the charity. I hope this enthusiasm will be continued and the people in need will benefit from this project. With my best wishes and many thanks again. Namita. Thanks for your kind works, Namita. It’s a pleasure to publish your stories and support some amazing charities. Hi Allen and Christopher. Love the challenges. It does inspire a lot of writers to, 'have a go'. Me for one. Hope I've managed to submit properly. This is a great site. Thank you for running it. You have indeed - thanks for submitting, your story has now been published above. Grace Howard and Charley Swire are already wonderful writers. Chris, this was so much fun! Your contests and challenges are the best and I look forward to receiving all your emails and newsletters. To Hull And Back is my absolute favorite and I can't wait to see your finalists. Don't ever stop! Hi There, for challenge entries, do we have to use our full proper name, or can we use our penname? My penname still uses names on my birth certificate, just not my full name. I love this idea. In my life overseas I have had many sensory challenges which I can write about. Nairobi was the first in the first challenge - might do a second one, or there's Mauritius in the 1960's followed by Zambia, followed by Hong Kong in the 80's - now, there's a place! Using only 175 words is a challenge in itself! I must collect my thoughts, make a decision, and WRITE! Many false starts to come, but such fun to do. Thank you for this opportunity. A story for your sensorially royal collection. May it help raise more funds for the National Literary Trust. Hi Chris, thank you so much for including my story – it has given me quite a boost of confidence, as I had no idea whether it was worth including! No problem at all, John, thank you for submitting. It’s great to hear your feedback. One of the reasons the challenges exist are to boost confidence so writers feel inspired to go on and do better things. Great to hear it’s working! Hi Chris, I really enjoy these challenges, they're good exercises in editing your own material without (hopefully) losing the pace of the story. My last story's first draft contained 220 words and the second 190 before I hit target. Ah, brevity. I must convert the wife. Thanks, David - really glad to hear that. And thanks for sharing your editing process. I find flash useful for the same reasons as you, and apply the same techniques to my longer works now. If I write a short story of 4,000 words, I often find I can cut out 500 of them and tell the same story at a better pace.